Happy first day of summer! 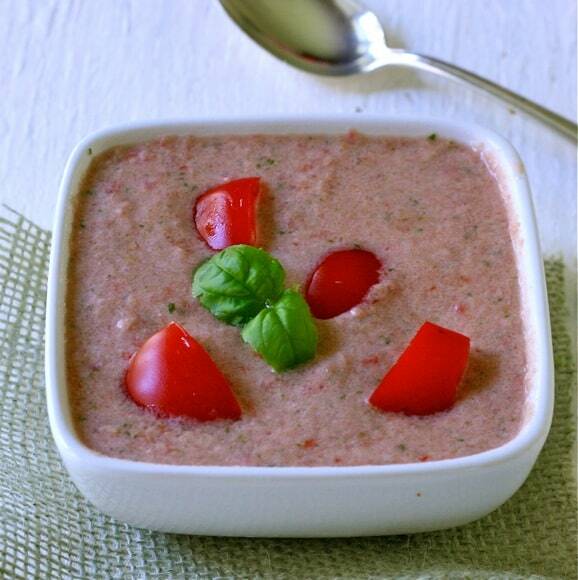 Tomatoes and basil, that classic summer combo, are spotlighted in this simple chilled soup. The first tomatoes of summer are just ripening here in San Diego. I was late planting my basil, thanks to a cool spring, so I sneaked a couple big plants into our grow box, pretending I had grown them from seed. Make this in the morning to allow the basil flavor to permeate the soup. If you don’t have time to chill the soup for 4 hours or so, mix it together in a metal bowl, then stick it into a larger bowl filled with ice and cold water. This recipe can be doubled and I think I’m going to do just that and serve it as a starter for our first summer dinner party. TIP: To easily peel tomatoes, score the bottom of each tomato with a knife, making an “X”. Next,pop them into boiling water for about 30 seconds, then place in a dish of ice water until cool. Cut a line around the middle of each tomato. Their skins will slip right off. A simple recipe for a chilled tomato soup with fresh basil. Using either a blender or food processor, purée the tomatoes and basil together. Transfer to a medium-sized bowl. Add the cream,lemon juice, salt, pepper and hot sauce. Mix well. Chill in fridge a minimum of 4 hours. Serve in chilled bowls. Tomato and basil, the perfect summer partners! Good tomato peeling tip, I’ve never tried cutting a line around the middle, will do that next time! Thanks, Jayne, it works every time. I love tomato soup – warm or chilled. I’ll be sure to try this. Oh Liz, love tomato soup, so perfect chilled for the summer…would love to be having some with you right about now 🙂 Recipe is pinned for later! Liz this sounds delicious! I love the addition of cream and lemon juice. Beautiful photo, too! Thanks, Lisa – I love chilled soup during summer. A cold tomato soup is so refreshing in the summer…especially when the tomatoes are from your garden. Agree – my cherry tomatoes are there – not the rest. Marking this one for when we FINALLY have worthy tomatoes here in the northeast.